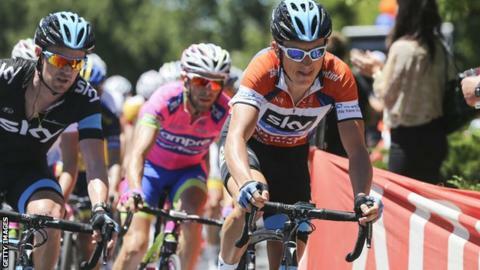 Britain's Geraint Thomas maintained his five-second overall lead after the fourth stage at the Tour Down Under. German sprinter Andre Greipel claimed his second stage of the week. Team Sky rider Thomas remains ahead of Dutchman Tom-Jelte Slagter in the overall standings after finishing safely in the peloton. "It was a stressful day as there was a bit of wind, and I think everyone was thinking about the potential cross-wind sections," said the Welshman. Thomas had to steer clear of two crashes in the final two kilometres. The first brought down four riders while the second involved 15 cyclists. "The boys were great. We stayed near the front with about 10 kilometres to go and they kept me out of trouble," said the double Olympic gold medallist. Greipel also managed to avoid trouble with Italy's Roberto Ferrari and Australia's Jonathan Cantwell second and third respectively. Thomas holds on to the ochre jersey with just two stages remaining. On Saturday the riders will take on the fifth stage which covers 151.5km, with three laps of a circuit starting from McLaren Vale before the final climb of Old Willunga Hill.